The Ronald McDonald Charities of CNY is moving forward toward building a new, 100% handicapped-accessible Ronald McDonald House, which includes private guest rooms with private baths, expanded dual kitchens and elevators. The new house will meet diverse needs and offer expanded services for new populations of guests and families. Geographically, the house serves families from the North Country to Northern Pennsylvania and from Herkimer to the other side of Auburn. 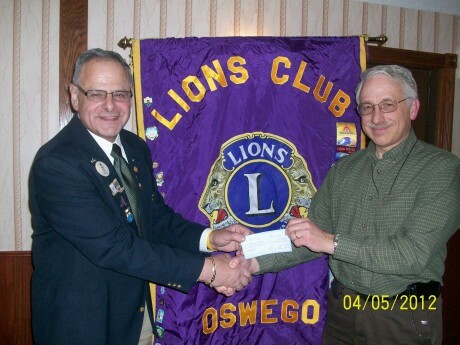 Under the leadership of District Governor Joseph DeFina and thanks to the Lions Clubs of 20-Y1, DeFina has raised more than $14,000.00 for the project. The CNY Ronald McDonald’s House is scheduled to be open in July 2012. Presenting the check to DG Joe DeFina is Lions Club President Steve Jurivich.